Choosing the right type of wood for your dining table is essentially the most important thing that you have to consider when furnishing your dining room. After all, a dining table is the single most important piece of furniture that is going to make a statement in the entire room. This is why it is important to properly consider your options and make sure the solution you have set your eyes on properly complements the appeal of your dining room. On the other hand, you would also have to figure out your chair materials because they have to go well with the table. However, this can often be left aside because most of the tables come in sets, and the chairs are typically included. Before starting to search for the right type of wood, you have to take certain factors into account. Right off the bat, you need to make sure that your dining table fits the room. This piece of advice is incredibly important. The dining table is not just a place to eat – it’s the center of the room around which everything else revolves. This is why you have to make sure your measurements are accurate. You should also take into thorough consideration the rest of your furniture and the material that it’s made of. If you have any other wooden furniture, it is advisable to get your dining table in the same wood type. This will not only make a statement, but will also complement your dining room design pattern. Shelves, kitchen drawers, floor type– these are all things that you have to take into account. Next, you will have to choose table shape. The general decoration guideline is that small dining rooms go well with round tables while larger ones should go with rectangular models. 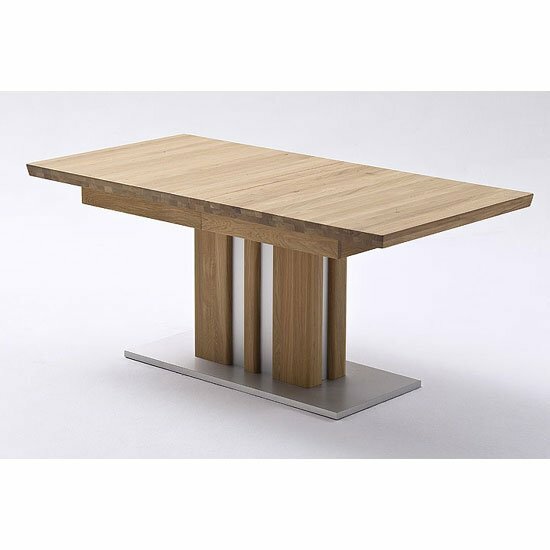 Almost every designer out there is going to advise you to purchase a table made of solid wood. The reasons for this are numerous. First of all, you need your table to serve its general purpose – to provide a stable surface for your entire family to dine on. This is why you need something durable and solid. Secondly, solid wood like oak or maple is going to complement contemporary interiors, which makes sense for the vast majority of homeowners. Wooden tables are also incredibly fashionable and hence are the most popular choice — especially, in this year collections. Whether you are going for a rough finish or a smooth one, you need to ensure that the finish is applied properly. This is going to give your table its overall appeal, ensuring both great looks and sturdy functionality. Keep in mind that a polished finish should better be avoided because it often gives an entire room an overly formal look. It is appropriate for the so-called industrial design patterns, but if you aim for comfort, you should take a look at the rough finishes.